My son always roots for the predator. He says they have to eat too. As someone who has a science background and as a conservationist, I know that I should agree with him. Or at a minimum, I should probably be neutral. But I can't help it. When I'm sitting on my couch watching a nature documentary, I root for the prey. Go rabbit! When it comes to managing wildlife though, I root for the predator. Why? Because wildlife policies inevitably favor the prey. Predators are the underdog--by a long-shot. And we're seeing evidence of that yet again. 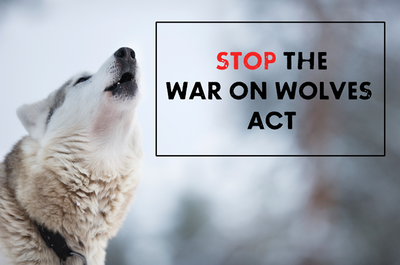 The day that we feared is here: Congress dropped its War on Wolves Act. And the war on wolves continues. 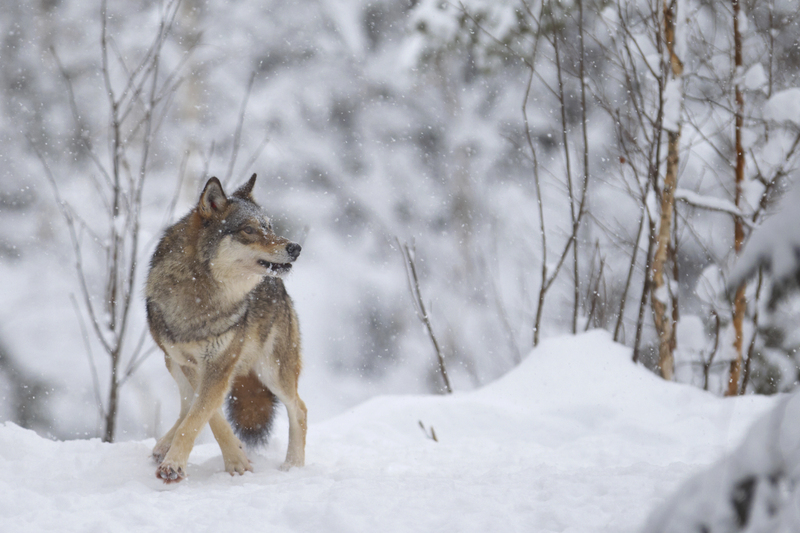 Great Lakes democratic Senators Klobuchar and Baldwin, both facing 2018 elections, joined republican Senators Barrasso and Enzi from Wyoming as cosponsors on the Senate's bill to kick wolves off of the endangered species list. 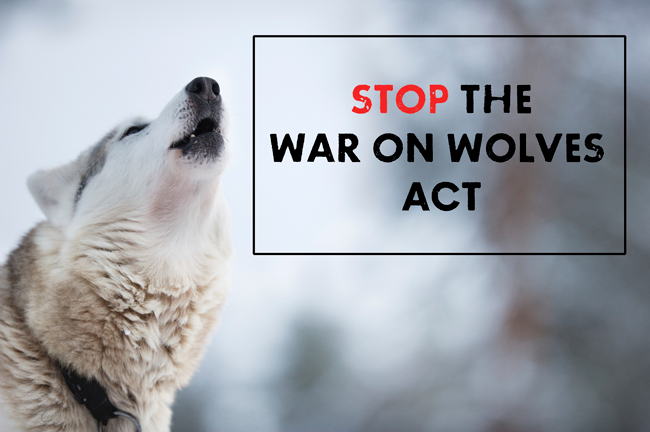 If it and its companion bill in the House pass, Wyoming, Minnesota, Michigan, and Wisconsin wolves will lose Endangered Species Act protections and these states will decide how to manage wolves. That will mean a swift start of trophy hunting and trapping in some states and even unsportsmanlike baiting and hounding of wolves in Wisconsin. Not one, but two federal courts have said these states' wolf plans are so bad, that wolves need to stay protected under the Endangered Species Act. The War on Wolves Act isn't just bad news for wolves, it's also bad news for the Endangered Species Act. The last thing that nature needs is a bunch of politicians picking and choosing which species get protected and which ones are left behind. As we all know, Congress and science don't always go together, especially when it comes to our natural world. Some believe that ranchers and wolves can't coexist. And yes there are individual ranchers and ranching groups that oppose wolves. But the truth is that only a fraction of one percent of cattle are killed by wolves. Things like weather and disease are the real dangers. Ranchers from Michigan to Idaho who follow best practices for ranching in wolf country have few conflicts with wolves. For starters, state fish and wildlife agencies have historically received the bulk of their funding from hunting and fishing license sales, as well as ammunition tax revenue. So hunters often have an outsize influence on the agency decisionmaking (so much so that, in many parts of the country, these agencies are called fish and game--not wildlife). And some hunters don't want anyone but humans killing deer and elk. Or they are trophy hunters who want to kill wolves. In any event, agencies tend to be protective of their budgets, which translates into a desire to maximize both ungulate populations and the quantity of hunting licenses available for sale. Additionally in many states, the agriculture lobby is a powerful political force, leading the fish and wildlife agencies to decisions that often protect livestock interests--even at the expense of wildlife. Second, wolves aren't just seen as one cog in the wheel of nature. They're seen as a symbol of the federal government. Since wolves were reintroduced by U.S. Fish and Wildlife Service into Yellowstone and managed by FWS in other regions, they're deeply associated with "the feds" and deeply despised by those who hate all things federal. Third is mythology. Wolves are smart, family-oriented, and communicative. Their personalities are clear. There was Romeo--the wolf who loved the dogs of Juneau and visited them every fall for five years. There was '06, the beloved Yellowstone badass who went without a mate for much longer than scientists anticipated, because it turns out, she didn't need a pack to bring down an elk. She could do it all by herself, even just days after giving birth to pups. There is Journey, unknowingly making history with thousands "watching" when his adventures took him to California and back to Oregon where he settled down and started a family. But we treat wolves differently than all other species. It isn't about science. It's about the mythology--the stories we tell ourselves. As children, we read Little Red Riding Hood. And we haven't let go of our childhood fears. We continue to tell ourselves this same story as adults: wolf as our enemy, our killer--just see Amanda Seyfried in the horror movie, Red Riding Hood or Liam Neeson in The Grey. Actually don't see those movies. Please don't.